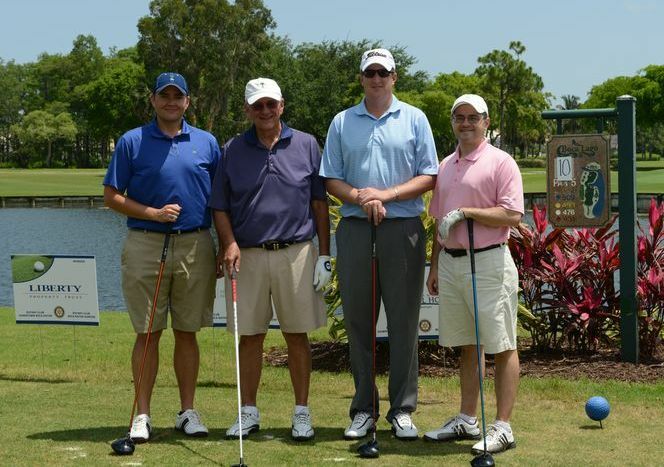 Boca Raton, FL (May 20, 2013) — The Rotary Club of Boca Raton Sunrise and the Rotary Club Downtown Boca Raton announced that the May 9th Golf Tournament held at Boca Lago Country Club raised more than $100,000. The announcement was jointly made by Co-chairs Bob Hildreth and Norman Matus. The two clubs honored the esteemed Dr. Ira J. Gelb, a visionary and medical leader who planted the seed for a medical school that came to fruition as the FAU Charles E. Schmidt College of Medicine. Dr. Gelb serves as a leader in his role of Assistant Dean for Pre-Baccalaureate Programs, Co-Director of Cardiology and Clinical Professor of Biomedical Science. He has also received the FAU President’s Distinguished Service Medallion. “This tournament was such an incredible success due to a very worthy honoree and two very dedicated clubs that worked hard to make this a wonderful experience for everyone involved,” said Hildreth. ”A key to the success and excitement of the fundraiser was selling tickets for the “chance to win” a 2013 Hyundai Elantra, generously donated by Delray Hyundai” he added. Each member of the first place foursome, that included Chris McFarland, Rich McFarland, Matt Thompson and Scott Wilson, was presented with a crystal trophy and $50 gift certificate to Uncle Tai’s restaurant. The second place foursome, that included Sharon DiPietro, Ingrid Fulmer, Kendra Fulmer and Debbie Schmidt, was presented with $25 gift certificate. During a celebratory dinner ceremony following the day’s play, Dr. Gelb was presented with a leather portfolio containing a journal of all the congratulatory ads and messages that were placed in his honor. The event committee also included Dr. Steve Alman, Marleen Forkas, Deborah Freudenberg, David Katz, Daniel Spandau and Honorary Co-Chairs Dr. Robert Colton, Eric Glasband, and Larry Nagle. For information about these Rotary Clubs, please visit www.rotarydowntownbocaraton.org and www.rotarybocasunrise.org.